The pigeon’s scientific name is Columba livia, given it by Johann Friedrich Gmelin, a German naturalist, botanist, and entomologist in 1789. Pigeons have been domesticated for several thousand years and have been used for numerous puproses by man. There are almost 300 breeds of pigeons and all of them are thought to descend from Columba livia. One such breed is the homing pigeon, capable of findings its way home over extremely long distances. Because of this trait, they had been used to deliver messages tied to their legs as early as 1150. In fact, Paul Reuter, founder of the Reuters press agency, had a fleet of pigeons that delivered news and stock prices between Belgium and Germany. They were also used extensively during World War I and World War II. 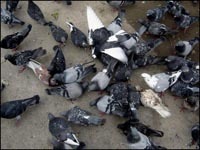 The United Kingdom used about 250,000 pigeons as messengers during World War II and even considered using them to deliver biological weapons. 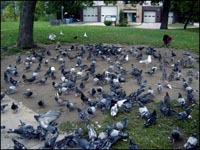 Pigeons were actually introduced in North America in 1606 through Nova Scotia, Canada. Their natural residence is Europe, North Africa, and south west Asia. Nowadays, pigeons are found in almost every city in North America.. especially in front of the strip-mall near our apartment in Toronto. Their life span is 3-5 years in the wild and up to 15 years in captivity. 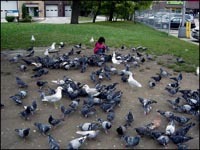 Numerous people, lunato and I included, give these pigeons food occassionally. Any and sort of bread left-overs are more than welcomed by these birds. They are so well trained that as soon as they see you reach in your pocket or shopping bag, they start flying frantically towards you. It’s pretty scary.. the way they swarm around you in seconds (see Video). Fat, lazy, dirty pigeons. They don’t have anything else to do now except eat and sleep.